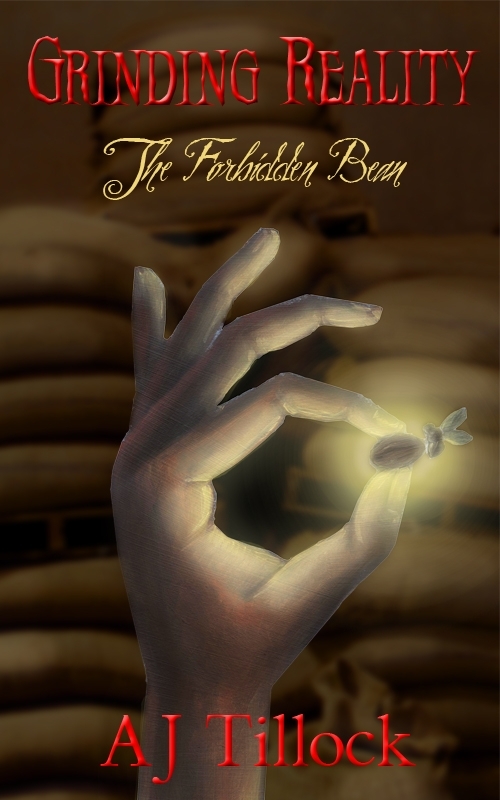 Artist Lindsay Beach created the cover for The Forbidden Bean, the first book in the Grinding Reality series. Tell us a little about your background and education. I started drawing at a young age and haven’t stopped since. In high school I took all the art classes I could, including additional classes outside of the school at Repenning Fine Arts in Audubon. After encouragement from several teachers, I decided to go to art school. I studied illustration from the University of the Arts, and received my BFA in illustration. While I was in school I started designing book covers. I had a target market project my junior year, and I chose to base mine on young adult book covers, and then for my senior thesis I also chose that young adult book cover market. Then after I graduated, Barbara Meyers granted me the opportunity to do her book cover, which was a great experience. Currently, I have done two commissioned book covers. While I was in school, I did about six or seven book cover projects. What do you enjoy about doing cover design?It gives me a chance to tell the reader about the overall tone of the book in one visual cue. In a way it can be a challenge, but I like a challenge. What’s your least favorite aspect of doing cover design?Can’t say there’s anything yet that I don’t really enjoy about them. Maybe if the challenge of finding that one perfect visual cue takes longer than I would like. Do you want to hear the author’s ideas for the cover? Do you find them helpful or a hindrance?I do like to hear them because in the end the author is my client. Also, the book is something that the author has worked very hard on, so I want to make sure I make something that they would be proud to have represent all of their efforts. Can you tell us a little about the actual process you go through when designing a cover?I first like to gain information about the book, whether it is a summary or some brief information from the author. Barbara gave me a synopsis. Then I take in any additional information the author may provide me with, such as some of their ideas for how the cover should look, and go from there. I like to draw out sketches of my ideas first to send to the author before I paint, so I don’t end up creating a finished piece of an idea that the author does not like. Are there certain authors or genres you won’t work with?I would be willing to try any genre. Variety makes things interesting. I just did an illustration for the cover of a horror genre book, which is very different from The Forbidden Bean’s genre of contemporary fantasy, and I enjoyed doing both of them. Is the process different if you know a book will only be offered online?The only difference is that when I know a book is going to be offered online, I want to make sure that when the cover is shrunken down to thumbnail size that it will still read fairly well. Any advice or suggestions or “rules of thumb” you’d like to share?My rule of thumb for the artist would be to really talk with the author about their vision for the cover. Even if the author says “anything goes”, it is always a good idea to run some ideas and sketches by them before you get started on the finish piece. ajtillock, barbara meyers, cover art, fantasy, linsay beach. Bookmark.